Until 2011, Oreocharis was understood to be a mid-sized and quite obscure genus of about 28 species distributed in central and southern China, northern Vietnam and Thailand. Habitat for the species were generally shady, damp rocks by streams, in valleys or in forests on slopes or cliffs, with some species growing on dry, shaded rocks. It was known that there were a number of other similar and possibly related species growing across the same geographical area, but assigned to different genera. In 2011, Michael Möller and his colleagues published their extensive DNA-based research which resulted in the consolidation of eight other genera into Oreocharis, along with select species from another two. The “new” Oreocharis includes species originally in that genus, plus all species in Bournea, Dayaoshania, Deinocheilos, Isometrum, Opithandra, Paraisometrum, Thamnocharis and Tremacron, along with some species from Briggsia and Ancylostemon. Subsequent publications have transferred additional species from both of the latter two genera. 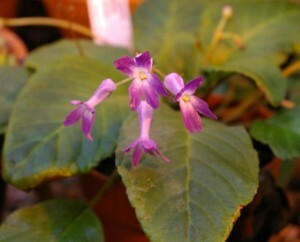 Several species are in cultivation, and it is likely that others will be soon.